It’s Monday! What Are You Reading? a place to meet up and share what you have been, and are about to be reading over the week. It’s a great post to organise yourself. It’s an opportunity to visit and comment and er… add to your groaning TBR pile! So welcome in everyone. This meme started on J Kaye’s blog and then was hosted by Sheila from Book Journey. Sheila then passed it on to Kathryn here at The Book Date. 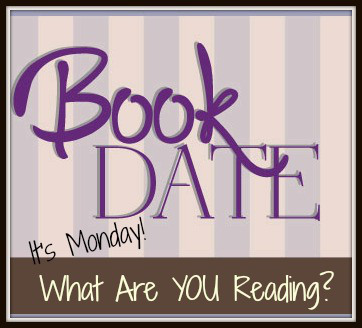 Jen Vincent, Teach Mentor Texts, and Kellee of Unleashing Readers decided to give It’s Monday! a kidlit focus. If you read and review books in children’s literature – picture books, chapter books, middle grade novels, young adult novels or anything in those genres – join them. Hope you all had a good week as we step into the depths of January. I had a good reading week and listened every opportunity I had to The Dream Daughter. I have kept my one word in mind! I realised that sometimes it can mean move -away! Yes away from the computer and social media! Partially successful!! And this morning I went to my first class in Tai Chi. I really enjoyed it and everyone was very friendly. So apart from next Monday which is a holiday I’ll be a regular I do declare! I finished listening to The Dream Daughter – a time travel book that was very, very engaging. Loved it. Then two historical fiction books and a contemporary one. Nice to have a mix. Well here we are in January 2019. I am happy to have the holiday season celebrated and now back into the work year. I need to make a list of all the people I need to contact to get some jobs done! It’s been a good week, lots of sewing and watching cricket. Sri Lanka is here playing us at the moment. Then India up next, they have beaten the Australians so will be interesting to see how our team stands up to them. My word for 2019 is “Move”. No not all about exercise! Just move on anything for ten minutes and see if I am into it. Like cleaning and tidying, gardening, phoning people to get things done – like order firewood and guess what, then I have to wheelbarrow and stack it!! Also I want to join a yoga and tai chi class. So move is about making a start and seeing the end point! Then maybe I’ll get there! Very much enjoyed my first read of the year. Learned so much I didn’t know about C. S. Lewis and Joy Davidman. So well researched and written. I also listened to this audiobook. Set in the time of World War 1 in France, England and Nova Scotia. Turned out to be a very good listen. Again had history that I didn’t know about. A library book, I read the first one last year and this is a follow up. My week seems to have been centred around my trip to Rotorua, which while tiring seems to have moved things forward. Lawyers are so slow! It took me a couple of days to recover after the long trip and then I had the pleasure of a friend’s visit Saturday. Other than that just a little of this and that. Next week will be Christmas Eve – so much excitement already amongst the little ones everywhere. A delightful Christmas story of family and reconciliation and understanding. A beautifully written book set in the marshlands of Nth Carolina. A haunting story full of nature, mystery and murder – a court procedure and a final reveal of the murderer that I just couldn’t adjust to!! You’ll know if you read it. Most people liked the ending – me … not so much! Well worth reading. A review book that is a republish I believe. Hope all those who celebrate Thanksgiving had happy celebrations. I can’t believe November finishes this week. Last week I finally had installed a book case that I had been planning and desiring for a couple of years. Just had to get the joiners to do it. With building booming – smaller jobs are more difficult to get done. Anyway its nice to have it completed and now I need to move on to curtains and new furniture suite, but I am sure you all understand – a bookcase is always first! Now I can use the old bookcases in the back bedroom for quilting fabric!! Hopefully I will have a good photo of it next week, light is too dark here to day because it is raining! I finished my reread and it remained a four star read as like the previous time. While rereading is something I desire to do, I look at all the books I have and I think … really I need to read some of those! This is both a review book and book club book. Short review will be published. I continue to listen to Anne Bishop’s Lake Silence, just have three hours to go. Am enjoying it and slowly becoming attached to Vicki and her cast of characters. It is a fantasy story I enjoy and the narrator is perfect for it. I am starting this today, recommended from Trish at Between my Lines. So it came in from the library recently. I’ve had this for awhile from the library, because it had no reserves on it I renewed it and read more pressing ones. This one I heard about on Anne Bogel’s podcast, and then it was mentioned again when she interviewed Jon Cohen, so it has to go next! Nada – no posts last week! Hope you all had a good week, so much has gone on in a week worldwide it is amazing. What caught my eye was the terrible fires in California, the celebration of 100 years since Armistice Day and of course the USA elections. I finished my reread of The Girl in Times Square. I was amazed at how much I had forgotten and I did enjoy it all over again. A Family Recipe – a library book was very enjoyable and the Jill Mansell audio was very engaging and had me chuckling away. Julia Quinn’s book is a review book. Sometimes I just feel like an urban fantasy from a favourite author! This is for an online book club, so far I am glad I went the audio path as its working out well this way. I think I’ll do a reread, not quite sure what. During November I am wanting to fit in a couple of rereads. Possibly this one – set in England, steeped in the Church of England and with quite a bit of psychology and theology. However I have read the whole series and was fascinated by the characters so I would like to reread the whole series again at some point. No I don’t belong to the C of E, but the character development in these books is what I remember. Welcome in, do join me by sharing your link to your look back at this month. I’m looking forward to visiting and seeing what everyone has been up to. The link will be open for you to share your post whenever you post over the next few days. Do visit each others’ posts. No challenges completed this month, although have furthered along my audio book challenge, but to complete would need to listen to 5 more. Maybe, maybe not. I read The Lost Pearl by Emily Madden for the Rachael Johns’ online book club, and… missed the live Facebook discussion but saw part of it later and some of the discussion. Mixed my days up, but… I not that worried. November’s book is to be Nine Perfect Strangers by Liane Moriarty. I don’t have a copy and looks like the library one might be a long way away! I enjoyed The Single Ladies of the Jacaranda Village by Joanna Nell and the guided discussion and comments into it from Joanna Nell added to it. The Books With Heart online book club run by Hachette Australia has not announced the November book which to my mind is too slow! I always love our October book fair run by the local Lions’ clubs, an excellent way to give and buy books! I must do a post soon on the books I bought. I got my vegie garden up and running, potatoes and pumpkins are up and so are the beans and just beginning to beat the snails. I have my tomatoes in two pots under shelter still. In the last days of October I worked some more on my bookshelf quilt and have to decided to “thread paint” (free motion quilt) on the names of authors I love. So that when I look at it, it makes me remember authors who have given me many happy reading hours. I will have some childhood ones, some I’ve loved for a long time, and some I have “found” in the last ten years. I have put two of those on from the last ten years as a trial and found I liked it, it will take quite awhile to get them all on but while I do it I remember the many happy hours of reading these authors gave me. This month I want to fit in some rereads. Books I know I love and have forgotten. My aim is about 3 – 4. Incoming library books might interfere with that! Audio Books Purchased with Credits. I had a really slow week reading. I loved When We Found Home and so I slow read and enjoyed it. I also caught up on a few TV shows and quilted and gardened. Nothing to complain about! This weekend we have a long weekend as its our Labour Day on Monday. The sun is shining and a perfect day to sit in the sun and read! Plus still listening to How to Find Love in a Bookshop. This is by an Australian author, I haven’t read her before. Well I had a good week’s reading again this week. Sometimes its really nice to get on a roll like this! I am a listener to the podcast What Shall I Read Next with Anne Bogel. I rarely have any matches with what readers talk about but I just enjoy the book enthusiasm. But this week on podcast Episode 153 I was excited to have read the three books mentioned as favourites, plus some of the others. We are into Spring now. I even have some beans appearing up out of the garden. Things are starting to grow. The potatoes are in but haven’t appeared and I have a couple of pots of tomatoes to go out once the bad weather is really past. I even have some flowers blooming about. Do I sound like a gardener, well I’m not – I mostly spend my time beating back weeds which I dislike doing. Mostly the place looks somewhat unkempt!! All of these were so good. Tinsel in a Tangle was a short novella and well written. Will have a short review next week for my thoughts on Beartown. Being Magdalene was a YA book about a girl in a religious cult, very fact based and I was totally engrossed. What can I say about The Simple Wild other than I laughed out loud and cried. Loved it. I just finished listening to The Lilac Bouquet which was a heartwarming read of feuding people going way back and a young couple trying to organise their marriage through it all. I will start listening today to this one – #3 in the series, I just wanted something light to listen to as I potter. And this series certainly is a lot of fun. Who knew I’d get hooked into a cozy series! It’s Monday! What Are You Reading? October! And so we come to October. We started daylight saving here, we always have a long one. I’ll feel a bit hung over most likely for a few days. Surprising what a difference one hour makes. I really enjoyed my reading week, all my books were very good. Loving Jennifer Ashley’s cozy mystery series. and How to Walk Away sort of pulled me in and made me just go on reading. This is a YA book and was recommended by a librarian. It is #3 in a series and I haven’t read the other two but think it’ll stand alone enough. It is about a religious cult. Fleur Beale is a New Zealand author. I haven’t read her before so I guess its time! For me September was about keeping an eye on the reading challenges I had set myself, so I am interested to see how I went and how much further I have to advance! So for the last three months of the year I still have some challenges I’d like to advance a little more. I have finished the library challenge although of course I am still reading from the library! An American Marriage Tayari Jones – Fiction – Hardback. Ah, so many good books in this month. In the end I have chosen this book for my favourite but so many close runner ups! Now that’s a bit of a hard question, obviously my own bookshelf is groaning with books I want to read and some are also on the way and then of course the library will tell me a book is ready to pick up. But … let’s see. The first two are on my bookshelf, the Cathy Lamb is for review from Kensington. The anticipation for each book fills me with delight. I bought The Wednesday Wars by Gary Schmidt because his Okay for Now might just be my top favourite children’s book. This was the month of the feast from the library. So many of my reserved books came in! Looking at them now I see I have finished with them all and they have been returned! The pressure of other readers waiting! That one without a title is American Duchess: A Novel of Consuelo Vanderbilt. This month I also joined two Australian book clubs online on Facebook. One is Rachael Johns Online Book Club (Australian author) and also Hachette Australia’s Books with Heart Book Club. Each read one book a month and talk about it. Australian books of course, but I decided that I’d enjoy reading many of them, as they are mostly women’s fiction genre so I think it will be an excellent fit for me. The New Zealand population of 5 million is too small for such things! I know! I know! Many cities in the world have double, triple and more of that! You can see why when we travel for the first time we are a little over awed! The October read for Books with Heart is about a 79 year old woman. And that will cover a reading challenge topic for me as well. I’ve bought this one as too many reserves on it at the library! Rachael John’s club read is reading in October … I’ve bought this one as well and its on its way from Booktopia. (An Australian site) as I couldn’t find it in my local bookshop. Again too many reserves on it at the library, which is good! So that’s a wrap for September, I count it as a very good month. As we slide into October – I saw a blogger calling this Owntober which is a good reminder to read our own books! And I hope to read some more of them. But… there is the local book fair mid October where there will be cheap books. Hmm I’ll limit myself I think. Maybe ten at the most! Have I read last year’s haul, I need to look at that, maybe I haven’t even read one! Ouch. So what was your reading month like? Last month I had a book giveaway – I have contacted the winner but haven’t heard back, but I do believe she has been away so I’ll wait awhile longer to give her time to check her email. More news on that next time.